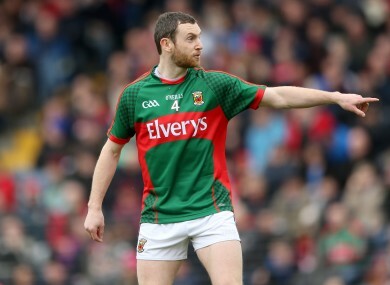 The Mayo captain says the mentality of the Mayo players changed dramatically under James Horan. Higgins was handed the Mayo captaincy this year. Mayo captain Keith Higgins has hailed the work James Horan did with the Mayo team during his four years in charge, saying the Ballintubber man completely changed the side’s mentality. Mayo have shown an unerring consistency in the last four years, reaching two All-Ireland semi-finals either side of two final appearances. Part of that is down to the level of professionalism the former boss brought to the Mayo camp. Higgins won four Connacht titles in a row under Horan’s stewardship, and admits the increased commitment to training has helped to get the best out of him, but there was a time when he may not have been so keen to spend his evenings in the gym. You might go and you might not go and you might go down to the chipper one of the days instead! Noel Connelly and Pat Holmes have come in to replace Horan for 2015 and Higgins revealed that there has been no major changes, just a few minor tweaks here and there. One of their first moves was to give Higgins the captaincy, the same honour they bestowed on him when they managed the All-Ireland winning U21 side of 2006. The three-time All-star has been a key member of the Mayo hurling panel in recent years but took the decision to step away from the county hurling set-up this year in a bid to focus all his energy on football. Given that I’m 30 years of age, it’s something that was always going to have to give. Unfortunately it had to happen this year. We’ll see what happens in the future. Higgins was named at corner-back for Mayo’s Connacht championship semi-final with Galway on Sunday afternoon as the green and red ignite their bid to capture a historic fifth Connacht title in a row. Email “Until James Horan came in you could choose the chipper over the gym according to Keith Higgins”. Feedback on “Until James Horan came in you could choose the chipper over the gym according to Keith Higgins”.